The What: Christie has launched the Christie Mirage SST, a high-performance RGB laser projection solution featuring Christie TruLife electronics. The What Else: With TruLife electronics, the Mirage SST delivers 4K resolution at 120fps, or, with an optional license, 480fps at 2K resolution. High frame rates remove blurring and strobing effects in fast-moving images, critical to creating an immersive experience for audiences. The Mirage SST further creates an ultra-realistic experience by achieving greater than 90 percent of the Rec. 2020 color space and 5,000:1 on/off contrast with ultra-high contrast lenses. With rich, highly saturated colors, a more natural color reproduction is also possible. 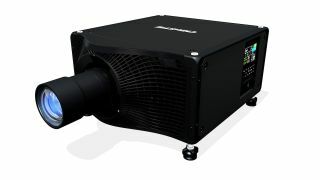 The Christie Mirage SST can be installed in single or multi-projector configurations and is compatible with Christie Mystique Install, which simplifies the design, installation, and maintenance of multi-projector arrays, and Christie Guardian, which offers automated, invisible, real-time blended image correction, even when content is playing. The Bottom Line: Featuring a compact, fiber-coupled projection head, the Mirage SST is well suited for complex, demanding applications including theme park attractions, dome theaters, and planetariums. Weighing 110 pounds (50 kilograms) and with its small form factor, the Mirage SST projection head enables installation where space constraints have previously been a barrier. The remote light source allows the chilling equipment to be placed away from the projector head, saving space and providing a whisper-quiet experience for audiences. The Christie Mirage SST ships in Q1 2019 with a three-year parts and labor warranty.